Moviephone is a new Android smartphone that has been announced at CES and the handset comes with a built in projector. The device comes with a 5.5 inch display with a Full HD resolution of 1920 x 1080 pixels, the device is powered by an octa core processor and it comes with 3GB of RAM and 32GB of storage as standard. There is also another version of the Moviephone which comes with 4GB of RAM and 64GB of storage, the handset also has a microSD card slot. 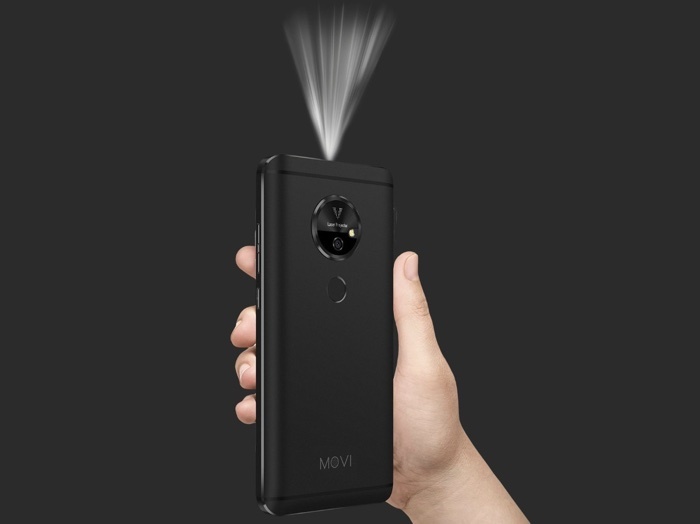 The Moviephone comes with a built in laser MEMs projector that can project an image of up to 200 inches in size, and it has a resolution of 1280 x 720 pixels. The handset also comes with front and rear cameras. On the front of the handset there is an 8 megapixel camera for Selfies and video calls and on the back of the device there is a 13 megapixel camera for photos and videos. The device comes with Android N and features a 4000 mAh battery, it is available now for $599.